Palm Springs International Shortfest, June 23-29, 2009. Philadelphia Independent Film Festival, June 25-28. Dubrovnik Libertas Film Festival, June 26-30. Screening in three fests over the same weekend, Kelly and I decided to attend the impressive (and very hot) Palm Springs Shortfest and Market. One of the best organized festivals I've ever attended. We saw dozens of great films, made lots of friends and showed L&RK to a packed, enthusiastic audience at an important world venue. Fest focuses on short film from around the world, with lots of parties, seminars and a lively filmmakers lounge. A lot of international connections are made, and the adjoining market allows everyone to catch films even if you missed the screening. A great experience thanks to the terrific selection of films and huge staff of volunteers. 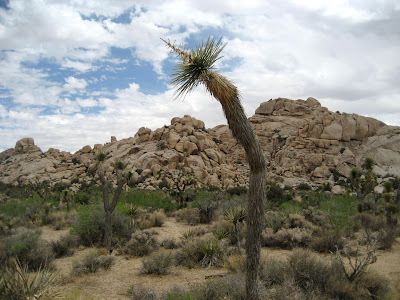 We explored nearby Joshua Tree, and found relief from 113 degree heat in the delicious local date shake. Palm Springs was a highlight of the fest circuit, I hope to come again. Next up: Puerto Rico Cinefiesta in July, Montreal Worldfest in August and Williamstown in October.